The title is a bit of a misnomer, we are not going to recover the password, we are simply going to change the password to one we know. Note: This procedure works on models, 2900, 2940, 2950, 2955, 3500XL, and 3550. Before you start connect the the device with a console cable and terminal emulation software, the procedure is the same as the one I’ve outlined here. 1. Power the switch off >press and hold the “Mode” button > Power on the switch. 2. For 2900, 3500XL and 3550 Switches release the mode button when the 1x LED light goes out (all the other port lights will remain lit). 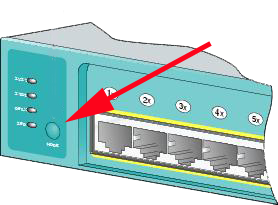 For a 2940 and 2950 Switch release the mode button after the “Stat” LED goes out. For a 2955 switch press CTRL+BREAK. 3. On screen you should see the following. Note: don’t forget the colon on the end or it will error and say “Permission Denied”. 6. We are now going to change the name of the config file so when the switch boots it will start with no configuration, then we can boot the switch. 7. Eventually when the switch boots it will ask if you want to configure it, say no. 8. At this point we can go to enable mode, change the name of the config.text file back again, and load it into memory (press Enter to accept the default filenames). 9. Finally you can remove the password, and reset it to whatever you want, and save the new config.